Over two decades ago when Dolly the sheep hit the headlines for becoming the first mammal ever to be cloned from another individual’s body cell, it raised fears and hopes that human cloning would soon follow. She died over 15 years ago. Yet, even as animals, including monkeys and dogs, continue to be cloned successfully, a human being is yet to be cloned in real life. A case in point is that of Sinogene, a Chinese biotech company, that cloned a gene-edited beagle May 2017, and announced this December that it had cloned “Juice"—a one-foot tall stray mongrel. While human cloning, which may or may not eventually happen, is bound to raise a lot of alarm bells given the moral implications surrounding the issue, the fact is that human genomes, or genes, are being routinely edited in a bid to find solutions for what are today considered to be incurable genetically inherited diseases. There is, for instance, no cure for those who have to live with beta (ß)-hemoglobin or ß-thalassemia and sickle cell anaemia type of genetic blood-related disorders. These anomalies are caused in the human body by mutations in the gene-encoding hemoglobin-ß (HBB)—a protein in red blood cells that transports oxygen from the lungs to all other parts of the human body. While some patients with these blood-related disorders can been treated with stem cell transplants, either from the blood or bone marrow, finding the right donor is very difficult even as transplant-associated clinical complications pose a major hurdle. Hence, researchers the world over are now experimenting with a gene-editing tool known as CRISPR-Cas9 to address this issue. CRISPR, which stands for “Clusters of Regularly Interspaced Short Palindromic Repeats", is a tool that allows researchers to easily alter DNA sequences and modify gene function. 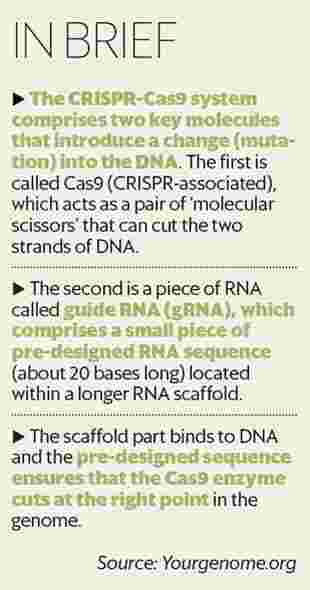 The protein Cas9 (CRISPR-associated, or Cas) is an enzyme that acts like a pair of molecular scissors, capable of cutting strands of DNA. CRISPR-Cas9 is primarily known for its use in treating diseases like AIDS, amyotrophic lateral sclerosis (ALS) and Huntington’s disease. Researchers are now looking to extend its use to tackle famine, lend a hand in creating antibiotics, and even wipe out an entire species such as malaria-spreading mosquitoes. As an example, Yinong Yang, a researcher at Penn State University, used CRISPR-Cas9 two years ago to edit a particular gene in a white button mushroom so that it does not brown easily. By genetically engineering a person’s bone marrow cells, researchers can reprogramme their immune and circulatory systems. Some new cancer treatments are based on this. Further, looking at the DNA of the collection of microbes in your gut can help with digestive disorders, weight loss, even help understand mood changes. Closer home, scientists at the Institute of Genomics and Integrative Biology (IGIB) and the Indian Institute of Chemical Biology (CSIR-IICB) are trying to correct such mutations in their laboratories using CRISPR Cas9 with encouraging preliminary results. Although, due to regulatory and ethical concerns, it may take a while before they can use this on humans. IGIB also sells CRISPR products such as Cas9 proteins and its variants to educational institutes at reduced prices in a bid to encourage use of the technology. On 14 February 2017, the advisory group of the National Academy of Sciences and the National Academy of Medicine decided to support research using technologies such as CRISPR to modify human embryos for prevention of serious diseases and disabilities. 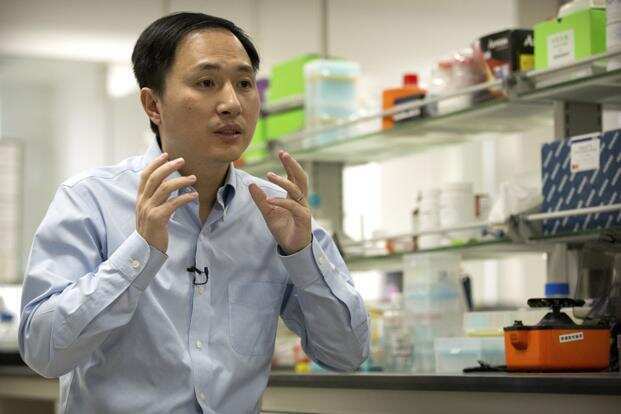 Yet, CRISPR Cas9 alarmed the world when MIT Technology Review reported on 25 November that a Shenzhen-based Chinese researcher, He Jiankui, claimed that he had created the world’s first genetically-edited babies by altering their DNA using CRISPR. This was despite Jiankui’s claim that the genes of the twins had been edited in the hope that the children would be resistant to HIV, smallpox and cholera since he had disabled a gene (CCR5) using CRISPR-Cas9. Critics raised a valid point that CRISPR, with its power to change genetic make-ups, raises a large number of ethical issues such as whether it should be used to produce designer babies or super humans. Besides, researchers say there is insufficient data to allow them to evaluate the risks and benefits of using this technology in humans. Even Chinese vice minister of science and technology, Xu Nanping, termed Jiankui’s work illegal in an interview with China state media, Associated Press reported on 29 November. A day later, the Chinese Clinical Trial Registry was updated to indicate that Jiankui’s embryo editing trial has been withdrawn. Scientists at the Wellcome Sanger Institute, for instance, say CRISPR-Cas9 gene editing can cause greater genetic damage in cells than was previously thought. These results create safety implications for gene therapies using CRISPR-Cas9 in the future as the unexpected damage could lead to dangerous changes in some cells, they said in a 16 July article published in the journal Nature Biotechnology. On 30 October, researchers from Charité-Universitätsmedizin Berlin said they found widespread immunity to the Cas9 protein by studying immune responses to CRISPR-Cas9 in humans. According to Pranav Alam, founder and CEO of a Mumbai-based DNA testing company, Genebox, “The use of CRISPR to create genetically-modified babies is an absolutely reckless and insensitive greed for recognition. There should be more regulation and governance of these labs. The use of CRISPR should be regulated." Alam is also a member of the biotech committee of the Confederation of Indian Industry (CII). In a 30 November report in Mint, senior scientist Debojyoti Chakroborty from CSIR-Institute at IGIB, cautioned that “...creating a child with specific traits or deciding how the next generation will be could open the technology for potential misuse by those who have the tools, funds and necessary resources". Yet, reasonably-priced DIY-CRISPR-kits continue to sell online, fuelling the belief that anyone can hack a genome. A case in point is that of Josiah Zayner who created quite a stir at a biotech conference, SynBioBeta 2017, in San Francisco last October when he injected his left forearm with CRISPR in a bid to grow bigger muscles. Zayner, founder and CEO of The ODIN, performed a full-body microbiome (genes of all our microbes) transplant on himself in February 2016, and successfully changed the bacteria in his gut. The ODIN is a company that says its goal is to make “consumer synthetic biology products". The US Food and Drug Administration (FDA), on its part, considers any use of CRISPR-Cas9 gene editing in humans to be gene therapy, and rules that the sale of DIY kits to produce gene therapies for self-administration as illegal. India, too, banned the use of stem cell therapy for commercial use last year following concerns over “rampant malpractice". However, the national guidelines do exempt the use of such therapy to treat certain forms of blood cancers, malignant lymphomas and tumours including sickle cell disease and thalassemia major. According to the US National Library of Medicine (NLM), scientists are still working to determine whether genome editing is safe and effective for use in people even as it holds out promise for the treatment and prevention of complex diseases such as blood cancer, thalassemia major, sickle cell and heart disease, mental illness, and HIV infection. Ethical concerns, according to NLM, arise when genome editing using technologies such as CRISPR-Cas9 used to alter human genomes. “Most of the changes introduced with genome editing are limited to somatic cells, which are cells other than egg and sperm cells. These changes affect only certain tissues and are not passed from one generation to the next. However, changes made to genes in egg or sperm cells (germline cells) or in the genes of an embryo could be passed to future generations," NLM cautions on its website. Further, according to critics, the use of CRISPR-Cas9 hinders natural selection and evolution and gives an unfair advantage to people who are able to have access to it, thus increasing the gap in opportunities between the rich and the poor since it could be used to create designer babies with desirable physical traits and talents. Thus, CRISPR-Cas9 is a work in progress and countries should have policies to govern its use. Simply rejecting it because of fear of misuse is akin to throwing the baby out with the bath water.